Cognitive Behavior Therapy asserts that all our actions and behaviors are a product of what we think and feel; therefore, if we want to alter our actions and behavior, we need to alter our thoughts and our feelings. Indeed, it does; especially in the field of health and fitness — for the road to health, fitness and wellbeing begins in the mind. We often feel dissatisfied by our body shape – especially when we reach a certain age when what used to be lean and mean becomes rounded and saggy. We often feel dissatisfied with the level of energy we have or the decreasing amount of work we can do before we feel tired. We begin to ask ourselves what happened and why. Sometimes, we don’t really notice the subtle, yet dangerous changes in our body and in our physiological responses to stimuli until we end up in the emergency room or the doctor’s office. Then, when the blood chemistry or scan reveals what is wrong, we get scared and anxious. People try to ignore these feelings of discontentment or dissatisfaction, fear and anxiety about the state of their health. Some deny that they have these feelings. But, these feelings are important. They can bog us down with self-pity and paralyze us in hopelessness or they can be the stimuli for positive action. These can be feelings that we don’t want to feel ever again so we do all that is in our power to get back into shape, and live a healthier lifestyle to prolong the days of our enjoyment of life and all that it has to offer. If you are concerned about your health, and lifespan and you are thinking about chronic illnesses and being at risk for such, you are not alone. 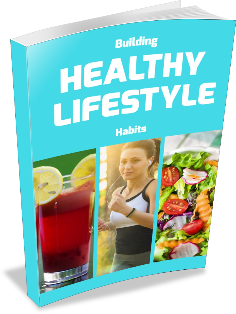 Maybe you have been diagnosed with a lifestyle related medical condition or know someone who has and it has started you thinking about your own health. At some point all of us begin to give serious thought to such issues, and good for you! This can motivate you into taking action. Once you’re on the edge of action, go further and set your mind and subsequently your behaviors to a healthy lifestyle. Don’t just sit there – let your fingers do the walking! Get on your smartphone or tablet PC and start browsing the internet for information. Be careful, though, there are so many sites out there that can scare you with misinformation and usually, also leave your pockets bleeding. Go to trusted sites and get relevant and accurate information about healthy diet and fitness. Read all you can to find out what that looks like, and then take action. Don’t just sit there – choices have to be made! Armed with your education from step one you can now examine all unhealthy aspects of your life and make a list of goals with specific action steps to reach them. Don’t just sit there – get moving! Join a gym, follow a healthy diet. Get a personal trainer. Go to an aerobics class at a nearby community center. Ask your doctor for advice. Don’t just sit there – make small changes that in time will result in big changes. Want to lose 100 pounds? Begin with losing 100 ounces. Begin by shaving off 100 calories from your diet by skipping your usual glass of soda or bag of chips. If you drink three cups of coffee a day, gradually cut down to two. If you take sugar and cream with your coffee, cut the cream and sugar in half and strive for black. Skip cake and choose an apple for dessert three times a week and build up from there. Make small changes and build it up. If and when you are trying to lose weight, it helps if you have a lot of self-control. But, it helps more in the long run if you know how to visualize. If you are reaching for another burger (on top of the three you already ate), then imagine the cholesterol clogging up your arteries. Imagine yourself unable to breathe because you’re having a coronary attack. Imagine yourself unable to walk properly because you’ve had a stroke. These are powerful images of what detrimental effects hyperlipidemia can have on your body. What is your most favorite thing to do in the world? Is it carrying your kids? Is it playing basketball or football with them? Is it driving your car? Is it going camping or traveling? Imagine how you are going to do those things (if you can still do those things) if you’ve lost the use of half of your body because you’ve had a stroke. Sobering visions, aren’t they? And they work. They stop your cravings! They distract your mind from the cravings and sway you towards a health mind-set. The mind is a powerful thing. It can make you do certain things that you would otherwise not do. A man who was diagnosed to be in the initial stages of coronary artery disease – his arteries were narrowing because of arterial plaque motivated himself to go on a diet and get exercise. He took the picture of his kids and put them in front of him every time he ate. Each mouthful of vegetable and fruit meant that much more time that he would around to watch them grow. Each time he felt like skipping his morning walk, he would imaging his kids living without his support and love. Immediately, he’d get up and walk like his life depended upon it – and it did. Happily, he was able to reverse the coronary artery disease through small lifestyle changes – his kids are now in college. Use your mind to be informed. Use your mind to choose what is good for your health. Use your mind’s eye to motivate you towards your health and fitness goals. It all begins in the mind.